Present day silicon based microprocessors work by moving electrons around a circuit. This results in generation of lots of heat due to resistance, which ultimately results in wastage of energy. According to an analysis by University of California, Berkeley's electrical engineers, they say; future computers may work differently, relying on magnetic microprocessors that consume the least possible amount of energy allowed by the laws of physics (thermodynamic laws). In the future Microprocessors employing nano-meter sized bar magnets for memory, logic and switching operations theoretically would require no moving electrons. North-South magnetic fields of closely spaced magnets allow logic operations like those in conventional transistors. Such magnet based chips would dissipate a mere 18 milli-electron volts (meV) of energy per operation at room temperature. That's the minimum amount of energy that is allowed by the second law of thermodynamics, according to what is called the 'Landauer limit'. Almost 50 years ago 'Rolf Landauer' a German-American Physicist used the newly developed information theory to calculate the minimum energy a logical operation, such as an 'AND' or 'OR' operation, would dissipate, given the limitation imposed by the second law of thermodynamics. The law states that "An irreversible process i.e. a logical operation or the erasure (to erase) of a bit of information dissipates energy that cannot be recovered. In other words, the entropy of any closed system cannot decrease. Landauer theory also states that the limit of the energy dissipation is proportional to temperature. Circuits cooled to low temperatures would be even more efficient. "Although, 18meV of energy is almost negligible in practical life. Jeffrey Bokor, UC Berkeley professor of electrical engineering and computer sciences, and grad student Brian Lambson are trying to develop these magnetic computers. Their goal is a computer that operates at the Landauer limit, which at room temperature equates to a loss of 18 millielectron volts of energy per operation. Although it all in theory right now. The first successful demonstration of a logical operation using magnetic nanoparticles was achieved by researchers at the University of Notre Dame in 2006. At this stage electrical currents are used to generate a magnetic field needed to erase or flip the polarity of nanomagnets, this dissipates a lot of energy. 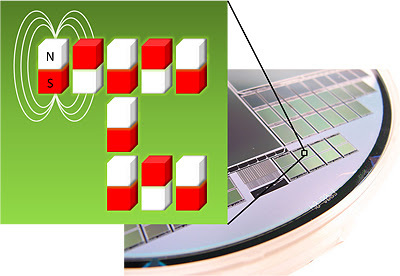 In the near future new materials like 'Multiferroic' will make electrical currents unnecessary, except perhaps for relaying information from one chip to another. Multiferroic alloys will allow to control magnetism directly with a voltage rather than an external magnetic field. There is no working prototype yet but if successfully made possible, this could have huge potential applications for ultra energy efficient portable computing devices in the future.